We have pretty good dental hygiene today—regular brushing, flossing, dental visits. But thousands of years ago? Not so much. Which means the old-timers' teeth had a lot of plaque. And today that ancient tartar is a gold mine for archaeologists. "What that's doing is basically entombing all this kind of biomolecular information that comes from your mouth." Jessica Hendy, an archaeological scientist with the Max Planck Institute in Germany. 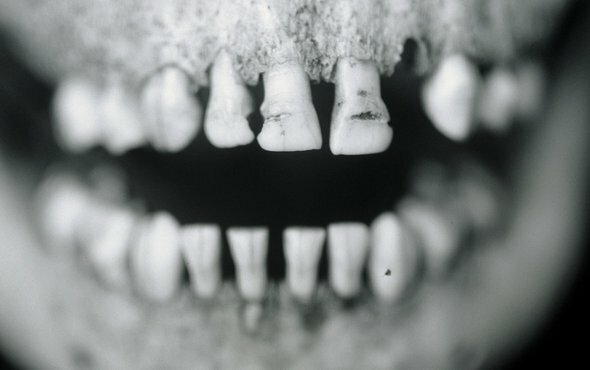 Hendy and her team used dental scrapers—just like your dentist uses—to remove tartar from human teeth found in Great Britain, dating from the the eighth century B.C. ...the Iron Age...all the way to the 1800s. With some modern samples thrown in, as a metric. They extracted proteins from the dental scrapings, then used mass spectrometry to reconstruct the menu. Across the ages were the remains of dairy products. "A﻿s well as milk we found evidence of cereal, specifically oats, and evidence of peas, and also evidence of something in the cabbage family." The full bill of fare is in the Proceedings of the Royal Society B. The study shows that probing proteins in tartar can help f﻿igure out ancient diets—especially for foods that themselves don't preserve well. And though good oral hygiene is extremely important..., if you forget to floss tonight, future archaeologists may thank you.